PS Vita Can Act Like PS3 Controller? The PS Vita portable will not only be a handheld game device, but may also be a controller for PlayStation 3. The big question is whether game developers will actually start designing titles that rely on both PS3 and Vita. 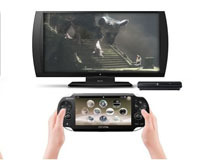 Effectively, Sony wants Vita to become a Wii U-like controller for the PS3 to rival Nintendo. "You could drive a display from a PS3 game [using PS Vita]. PS3 can send data down to Vita and Vita can display it. You could use the unique features [of Vita] - gyroscope, touch front and back - as a control device for a PS3 game. You can run software on both devices and use the network to sync the game states. That is pretty good, because you then have the processing power of PS3 doing that work, Vita doing fancy graphics however you want to do it. You are not sacrificing the PS3's CPU to be able to have a rich experience on Vita,"